I was invited to a CT Blogger event at V's Trattoria in downtown Hartford. V's serves up classic Italian fare with a unique twist. I'm not a food blogger but it's hard to pass on a savory culinary experience along with connecting with other blogger babes! I enjoyed each and every dish and loved the chef's enthusiasm and love for food. It's a gem of an italian restaurant in downtown Hartford. As I was sitting there, enjoying the relaxed yet sophisticated vibes of V's, I started to think about a retro-inspired Hartford city guide. I'm often in the New Haven area and being in Hartford inspired me to share with you some great vintage spots in CT's capital city. 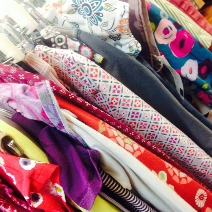 Blaze and Bloom is a vintage shop that offers clothing, accessories and home decor in all their retro loveliness. Their mission statement is: "repurposing, remaking, reusing, or upcycling, all with our unique vintage style in mind." They also offer crafting parties! Blaze and Bloom is located in the design district of West Hartford. This no frills, New England diner was built in 1931 and has retained it's classic style and charm. They serve up some mighty good breakfast too that's easy on your wallet. Quaker Diner is located in West Hartford. A.C. Peterson's is a dairy bar and diner circa the 1940's. It still has it's vintage vibes and serves up diner and ice cream shop classics. Enjoy their delicious milkshakes in a retro setting all year round. Max and Lily's closet is a colorful, adorable spin on a second hand store. It's a children's consignment shop full of great finds! This beloved boutique is located in West Hartford. This gem of a vintage boutique sells women's second hand clothing and accessories. Find stylish and one a kind retro pieces to add to your closet! What are your favorite retro spots in Hartford?